Oyster in its “shell”, preserved lemon, snow pea, hazelnut – Shigoku oyster in an edible shell made of clay and squid ink. Kinda interesting, but I thought I chewed on tiny fragments of real oyster shell… The preserved lemon peel provided a little acidity; the shredded pods of snow peas gave a little crunch; and the pink hazelnut powder added a little more texture. Egg yolk-mashed potato ravioli, caviar, cucumber – oh this was really yummy! The ravioli contained warm mashed potato along with egg yolk, the latter of which squirted out once some pressure was applied with the teeth. The tiny brunoise of fried Idaho potatoes and cucumber added a little crunch as well as flavor. Pools of grinnell caviar, which I think may have been flavored with cucumber water, were served on the side. Avocado-pea soup, smoked crab, pistachio – a cold soup where the avocado flavors were a little more dominant than those of English peas. The pikito crab meat had nice smoky flavors. There was a sprinkle of pistachio powder as well as dots of pistachio oil. Charred chicken liver, Szechuan, injera, melon – the chicken liver mousse definitely had some burnt, smoky flavors. Not sure what the Szechuan reference was about, but there was perhaps the slightest hint of spiciness. The compressed melon cubes and carbonated yuzu (柚子) and melon sauce were kinda interesting, providing primarily sweet flavors; while the pickled pearl onion offered some acidity. Injera flatbread offered some texture. Shrimp grits, pickled jalapeño – a seemingly simple dish which offered a nice contrast of flavors, as the corn added some sweetness to the otherwise savory flavors, along with a slightly spicy kick at the end from the pickled jalapeños. Garnished with shredded scallions. Yum. Bloodless sausage, smoked marcona, lily bulb, mushroom – given how much I love all types of blood sausage, the fact that I was served a vegetarian “bloodless” sausage was nothing short of ironic. I think the sausage was made in part with red beets and black rice. There was a purée of Marcona almonds, some pickled lily bulbs (which, following my dinner at Alinea, would be the second time I’m seeing this very Chinese ingredient in the space of a few days…), and some porcini mushroom sauce. No pork, no likey. Black bass, parsnip, pickled ginger, nori mustard – given the texture and flavor profile, I wondered if the black bass had been salted or marinated… but it was pretty nice. There was a long and thin strip of parsnip jerky, which thankfully wasn’t anywhere near as salty as the parsnip from Alinea. There was the parsnip and ginger purée, a mustard and nori (海苔) wafer, and some dots made with honey mustard. Milk braised pork collar, sunchoke, black sesame, kaffir – not really sure if I picked up anything different from the pork having been braised in milk, but the tablets of pork collars were certainly very tender. The little blobs of kaffir lime cream were very nice, and the adding a little of the black sesame smeared on the plate to the pork left a nice fragrance in the mouth. The small cubes of fried Jerusalem artichoke were unfortunately very, very salty. Cured duck breast, curd-n-whey, sweet potato, rice noodles – the duck breast was cooked sous vide and then pan-seared, which delivered serious amounts of char that somehow gave a hint of ginger. Wylie played with string again in this dish, making it out of fried black rice. We had a sweet potato ribbon as well as some sweet potato purée. I liked the clump of milk curd, but didn’t quite appreciate the acidity of the whey. Verbena mousse, rhubarb, buckwheat, camelina oil – this palate cleanser consisted of a thin layer of rhubarb ice at the very top, followed by a layer of verbena camelina mousse with pickled rhubarb encased inside, and finally a thin layer of buckwheat sablé at the very bottom. Loved the fragrant verbena, but not sure about the camelina vanilla oil. Absolutely hated the tiny amaranth leaf garnish, since it just provided unnecessary earthy flavors. Apple tart, pomegranate, sorrel, pistachio – very yummy. I love how the flavors of the apple tart brûlée were so much more powerful than normal, and I definitely didn’t mind the extra intensity of sweetness. The sorrel sorbet offered a nice balance at the other end of the spectrum, tempered by caramelized pistachio crumble. The red grapes provided a little freshness, and the pomegranate sauce smeared across half the plate was so nice I kept trying to scrape it off the plate. There was also a nice little piece of pomegranate tuile. Ovaltine cake, marcona almond, cardamom, sheep’s milk – hmmm… neither my friend nor I tasted much Ovaltine in the cake, and we thought it was just regular chocolate. The star of the dish was the cardamom ice cream inside the tube of malt tuile, as the flavors were just so distinctive and pure. There was a little bit of sheep’s milk yogurt, and sprinkle of cocoa mint candy, a little wedge of grapefruit and some Marcona almonds. Cookie dough ice cream – white chocolate ice cream wrapped in a cookie dough glaze. The cubes were dense fruit jellies flavored with cherries and root beer. Pretty interesting. I hadn’t been sleeping enough, and was a little tired from running around today, so I thought it best not to do the recommended wine pairing or drink a large amount of wine. Instead I opted for a single glass of 2011 Joh. 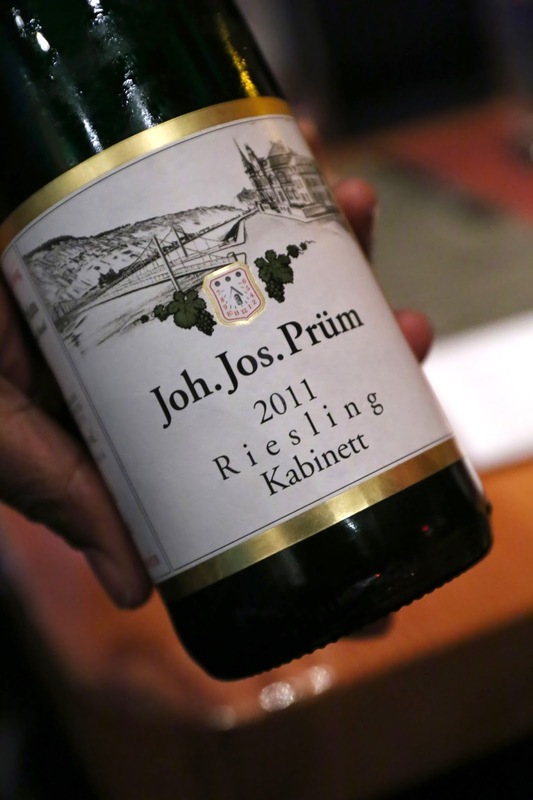 Jos Prüm Riesling Kabinett, which was very refreshing on a warm summer evening and not too sweet, and showed the classic notes of flint, white flowers and a hint of petrol. We were absolutely stuffed, and I felt a little bad for my friend since I kinda dragged her into this. No, this wasn’t a mind-blowing meal by any means, but it was nice and decent with a few highlights. More importantly, though, it was nice not to have one’s taste buds as-salted like mine were a few days ago. While Alinea may have been more playful, creative, with arguably superior technical execution, I found myself enjoying tonight’s dinner a whole lot more.